LEH Guitars is proud to announce their new flagship bass: the Offset 4-String. 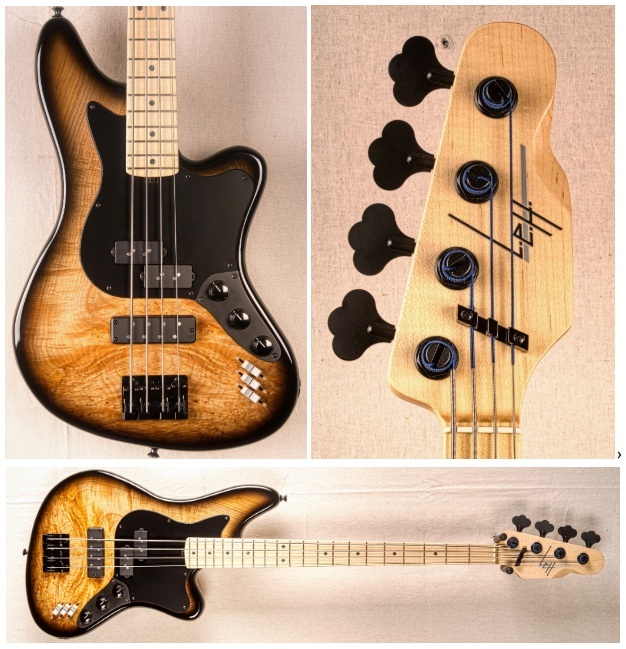 This instrument features an offset alder body with a maple burl top, strategic chambering in the body to reduce weight and prevent neck dive, 21 frets, a hand-carved maple neck, a “design patented” 3-knob slider preamp design, Nordstrand Audio NP-4A and Big Rig pickups, a custom-wired Nordstrand Audio 3-band preamp, Hipshot and Gotoh hardware, and a Pat Wilkins finish. Not a novelty: the first thing you’ll notice about the LEH 4-String is the unique 3-knob slider preamp. At the root of the system is a 3-band Nordstrand Preamp, modified for boost only with three Bornes faders. “A fader is a more visual way to dial in your eq,” notes Lisa Ellis Hahn (the LEH in LEH guitars). “Knobs can be hard to see onstage and it’s easy to second guess your settings. With sliders, you can instantly “see” your sound.” The bass also features a stepped heel allowing players unfettered, comfortable access to the upper frets. For direct purchase or custom order.